You are looking at posts in the category food. Posted on January 7th, 2008 by george. To get a cone in this town? There are no less than four McDonald’s within five miles of my house. Much like Wal-Mart, it is my express endeavour never to travel there. But once in a while, a guy gets a hankerin’ for something unhealthy to eat. I while I will never again eat any of their beef, there’s nothing quite like the soft serve they…serve. So over the past week (since New Year’s Eve, actually, when the craving first hit) I have been trying to get my grubby little paws on an ice cream cone from Mickey D’s. The 24-hour establishment in Cape Canaveral claimed their machine is down (I’ve since checked back and it’s still down). Something about the only guy who knows how to service it being on vacation. That same night I figured I’d try the McDonald’s down the street in Cocoa Beach, but they were closed. Added bonus: I got an erroneous speeding ticket on the way back home. In the long and sordid history of me and Johnny Law, this will be the first citation I show up in court to protest. It was New Year’s Eve, people. There were cops everywhere. I categorically deny even flirting with the speed limit. I honestly think the cop pulled over the wrong guy, or was just fishing. My radar detector didn’t go off. Not to mention she pulled up behind me with her lights on while I was at a red light. Stopped. And she claims I was doing 50 in a 35. Um, no. Anyway, the ice cream! So two nights ago I figured I’d try my luck with the Mickey D’s on Merritt Island, also a 24-hour joint. All this brings us to this evening. As I mentioned earlier, I avoid Wal-Mart like the plague. But my new roommate Antonio (a co-op student from Puerto Rico) needed new flourescent lights and a shower curtain for his bathroom. What are ya gonna do? On the way there it dawned on me. Aha! This Wal-Mart has an in-house McDonald’s, for maximum this-is-the-depressing-state-of-America effect! My cone! I could almost taste sweet, creamy victory. Posted on September 23rd, 2007 by george. I was absolutely transfixed by this photography project, sent to me by photojojo. You’ve heard of people resembling their dogs. Well how much more telling is it to see what they eat for brekkie? I found myself inventing entire life histories for these portraits that are at times haunting, spare or funny, but always expertly captured. They feel so intimate; it must be the slanting morning light, the sleep still in the faces, the blank stares. Oh, and of course, the brekkie. Props to the brilliant creator, Jon Huck. I’m curious how he knows so many interesting characters, especially those that will share brekkie with him in their homes (or on their morning commutes) and let him take their picture so early in the morning. 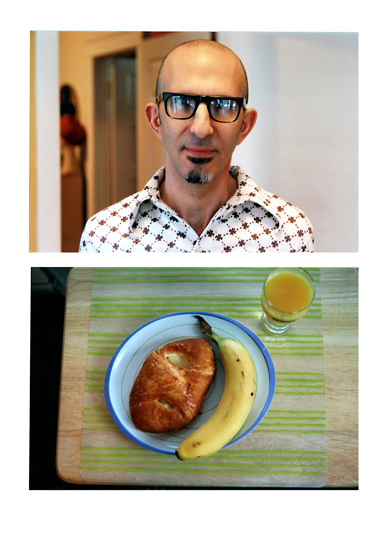 Also: did you know there’s a website called Mr. Breakfast? Sweet! Posted on July 14th, 2007 by george. I awoke this morning to a text message from my coworker, Kevin. That’s strange. I’ve never received a text from him before. Here’s what it said. Awesome. I must have made an impression that time I had dinner with them and took photos of the food. Thanks Tara!